Last night my other half had a slight issue whilst driving — the car was stuck in one gear and making a strange noise. So she did the sensible thing and pulled over. Trouble is, she didn’t quite know where she was. ‘Right,’ I said, flicking up Google Maps, ‘Can you see the turn off?’ I asked, staring at junction 10. At this point I was doing the mental equivalent of slapping my head with frustration. If she had a Nokia E90, she could simply load up Google Maps and bish-bash-bosh, the system would have located her with a brilliant little flashing blue dot in seconds. But no. She’s using a Nokia E61i. Arse. ‘Ok, got an idea,’ I said, flicking up Google and typing in some keywords to the effect of mobile, locate, LBS. ‘OK,’ she said, shivvering down the phone at me. Arse. The first site I found was ChildLocate. I quickly created an account and then tried to buy Â£5’s worth of credit. The site wouldn’t accept my Maestro (“Switch”) card. So I tried a credit card. Woosh. It worked. I added Hetty’s number as ‘a child’…. And I waited. 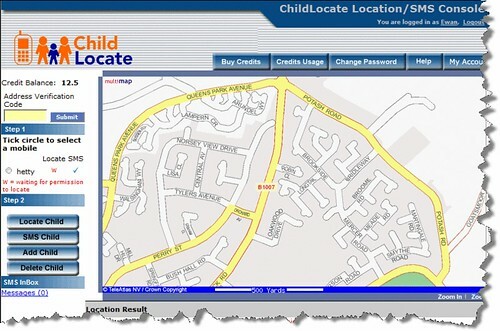 I phoned her, ‘Listen, could you reply to the verification text?’ Obviously for data protection reasons, ChildLocate can’t just look up the location of anyone’s mobile. You have to explicitly opt-in. ‘I have!’ she tells me, perhaps through gritted teeth. I couldn’t tell. I sat staring at the screen. I logged in and out of the service. I couldn’t locate her mobile because the system wouldn’t let me. It said it was ‘still waiting for verification’ from her. So, excellent. That’s good. She safe and being transported home. Meanwhile muggins here back at base with the technology — all the might of the UK mobile industry — was rendered less than helpful. I daresay there’s a reason why the ChildLocate system didn’t work as I expected it. I logged in a few times in the 5-10 minutes after this event and nada. I’m going to get her an E90. An EV-DO MacBook Air? I’ll have one of those! Why didn't you ask her to download google maps to the E61i? It would have got her within a few miles. I note that unless she was on Voda, the childlocate error is around 2 miles anyway. ….and according to their FAQ, once authenticated, you could spy on her whereabouts without her knowing. Not good. Imagine if your boss authenticated this service on your mobile? reply to a different number and it was too much of a hassle. What – lost, alone, in the dark, beside a motorway, with a broken motor? The latest version of Google Maps for her E61i should be able to use cell-tower triangulation to determine her location. Pressing the '0' button activates it. I've loaded it up on Christina's N81 8GB and it works pretty good. Can take a while, but then again, it's free GPS, so who's complaining? I put it on there to prevent that exact situation.